고려시대 만들어진 높이 6.9㎝, 아가리 지름 16.6㎝, 밑지름 4.0㎝인 청자완으로, 바닥에서 아가리까지 거의 직선에 가깝게 벌어진 형태이다. 그릇 안쪽 아가리 가까이에는 음각된 덩굴무늬로 띠를 둘렀으며, 그 아래쪽에는 화문을 꽉 차게 배치하였으며, 바닥에는 작은 원이 새겨 있다. 화려하고 섬세한 이러한 음각과 양각(양인각) 문양은 중국의 영향을 받은 것으로 이해되고 있다. 그릇의 바깥부분에는 다른 장식은 없고 4군데에 국화문양을 배치하였는데, 도장을 찍은 듯한 국화송이는 흰색으로 상감하고 잎은 검은색으로 표현하여, 흑백의 대비가 선명하면서도 조화롭고 단정하다. 한 그릇에 음각과 양각, 상감문양이 함께 있는 드문 예로, 고려시대 상감청자의 초기 상황을 이해하는 데 좋은 자료가 된다. 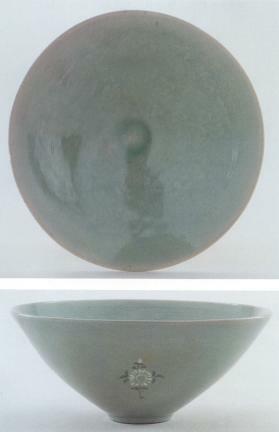 As a celadon bowl that dates back to the Goryeo Period, it has height of 6.9 cm, mouth diameter of 16.6 cm, and base diameter of 4 cm. The bowl is almost as flat as a horizontal plane from its base to the lip. There is a band of scroll design around the inner lip of the bowl. The space below the band is filled with engraved lotus leaves, with a small circle engraved on the bottom. Experts believe that these detailed and magnificently engraved designs are influenced by Chinese pottery. There is no decoration on the outer side of the bowl, except for the chrysanthemum designs on four different places. The chrysanthemums are inlaid in white, looking as if they are stamped. The leaves are expressed in black, creating a clear, harmonious contrast of black and white. 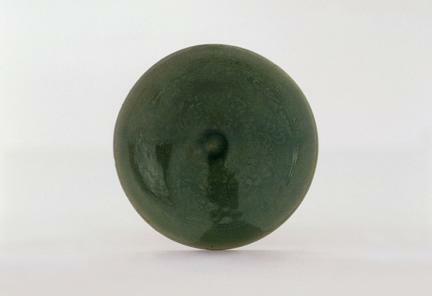 Its entire surface is coated with a fine layer of translucent glaze. As a rare example of a single piece with both engraving and inlaid designs, it also provides valuable information in understanding the early development of Goryeo celadon ware.